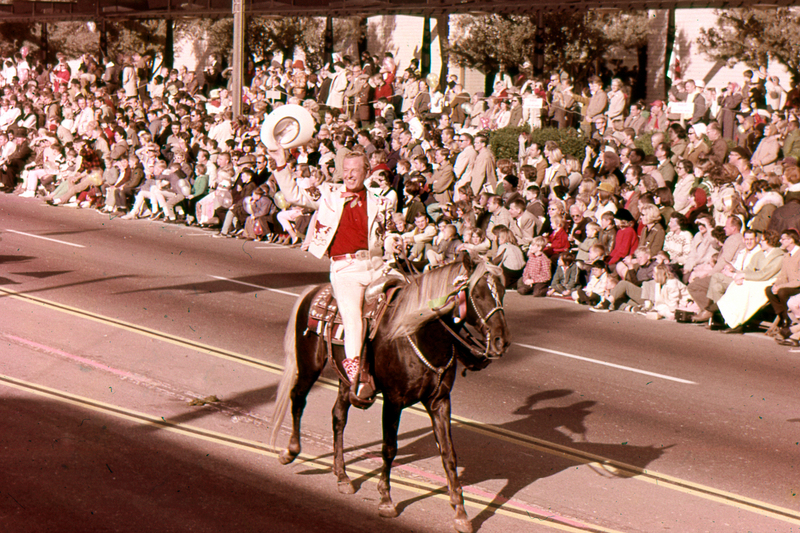 Western signer and actor Rex Allen in the 1965 Tournament of Roses Parade in Pasadena (Jan. 1, 1965). Rex Allen was inducted into the Newhall Walk of Western Stars (then called Walk of Fame) in 1982 — its second year — immediately following William S. Hart, Tom Mix and Gene Autry in 1981. Born Rex Elvie Allen on Dec. 31, 1920, to Horace Allen and Faye Clark, Rex grew up on a homestead 40 miles north of Willcox, Ariz. Rex was a real cowboy who became the last of the singing cowboys of Western movie fame. As a boy Rex played guitar and sang at local functions with his fiddle-playing father. After high school graduation, he followed the rodeo circuit but decided that his future looked better with a guitar than with the rodeo. He got his start in show business on the radio in New Jersey as “Cactus Rex”, then performed in Chicago on the WLS Radio program, National Barn Dance. In 1948 he signed with Mercury Records where he recorded a number of successful country music albums. In 1952 he switched to the Decca label where he continued to record into the 1970s. In 1949 when singing cowboys like Roy Rogers and Gene Autry were much in vogue in American film, Republic Pictures gave Rex a screen test and put him under contract. From 1950 to 1954, Allen starred as himself in nineteen western movies. Rex was one of the top-ten box office draws of the day, and his character was soon depicted in comic books. On screen he personified the clean cut, God-fearing American hero of the wildwest who wore a white Stetson, loved his faithful horse named “KoKo” and had a loyal buddy who shared his adventures. Allen's comic relief sidekick in several of his early movies was Buddy Ebsen, then followed in later movies by character actor Slim Pickens. Over his long career, Rex Allen wrote and recorded many songs, a number of which were featured in his own films. Late in coming to the movie industry, his film career was relatively short as the popularity of westerns faded by the mid 1950s. Rex has the distinction of making the last singing western in 1954. As other cowboy stars made the transition to television, Rex tried too, cast as Dr. Bill Baxter for a half-hour weekly series called Frontier Doctor which ran from 1958 to 1959. Rex Allen was gifted with a rich, pleasant voice, ideally suited for narration and was able to find considerable work as a narrator in a variety of films, especially for Walt Disney Pictures wildlife films and TV shows. He also was the voice of the father on Disney's Carousel of Progress, which was presented at the 1964 World's Fair and now is at Walt Disney World. In addition to Disney, Rex provided the narration for the Hanna-Barbera animation of Charlotte's Web. He was also the voice behind Purina Dog Chow and Ford Truck commercials for many years. Rex had a three octave range. In his later years, he also performed frequently with actor Pedro Gonzalez-Gonzalez. Pedro appeared at Rex Allen Days celebration until his death in 2006. For his contribution to the motion picture industry, Rex Allen was given a star on the Hollywood Walk of Fame on Aug. 20, 1975. He was inducted into the Newhall Walk of Western Stars on Aug. 28, 1982 (its second year), and in 1983 he was inducted into the Western Performers Hall of Fame at the National Cowboy & Western Heritage Museum in Oklahoma City, Oklahoma. He was the first recipient of the famous Golden Boot Award. In 1989 his life story was told in the book Rex Allen: My Life Sunrise to Sunset written by Paula Simpson-Witt and Snuff Garrett. Rex Allen died Dec. 17, 1999, in Tucson, Ariz. He died of a massive coronary, causing him to collapse in his driveway. As he requested, his ashes were scattered around a larger-than life bronze statue of Rex in the park across the street from the museum. Rex's horse, KoKo, is buried at the foot of the statue. Rex's oldest son, Rex Allen Jr., is also a successful performer and musician with several country hits. Rex Jr. is still performing today. LW2771: 19200 dpi jpeg from color transparency (photographic slide) by Rose Parade Movies of Hollywood; purchased 2015 by Leon Worden.